The firing of the biggest rocket in Britain for some 20 years will take place next month at the Aerohub, Newquay Cornwall Airport. 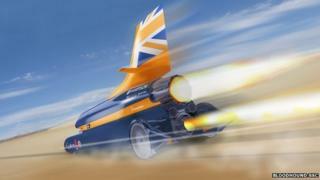 The hybrid rocket is being developed for the Bloodhound SuperSonic Car, which will attempt to reach 1,000mph (1,610Km/h) in 2014. Newquay Airport is one of the few UK locations equipped to handle the test. The Bloodhound team will conduct a number of experiments leading up to a high-power firing on 3 October. Capable of producing 27,000lbf of peak thrust (122kN), the 18in by 12ft (45cm by 3.6m) rocket will be bolted to a stand so it cannot move. "We're still in the research and development phase of this project, but the firing at Newquay Airport will be the first time we've pushed the [rocket] chamber in the region of its performance limit, and it should make for quite a spectacle," rocket creator Daniel Jubb told BBC News. Remarkably, his power unit will not be the only one in the Bloodhound vehicle when it tries to break the world land speed record on a dried-up lakebed in South Africa. There will also be a jet from a Eurofighter-Typhoon and the engine from a Formula One car. "I think in 2013, we would like to be able to set a new world land speed record in the region of 850mph; and then in 2014 get up to 1,000mph," Mr Jubb explained. In rocketry, hybrid means a mix of solid and liquid propellants. In this case, the British rocket will be burning a mixture of a solid, rubber-like fuel (HTPB, or hydroxyl-terminated polybutadiene) and a liquid oxidiser (high-test peroxide, HTP). For Bloodhound's record attempt, the rocket will be required to operate for about 20 seconds, in which time it will consume almost a tonne of HTP. It is hoped the rocket will produce the equivalent of 20,000-30,000bhp during the burn - just under half what it should produce in its final, record breaking configuration. This is where the F1 engine fits into the project. Cosworth, which manufactures power units for several cars on the F1 grid, is making one of its CA2010 engines available just to push the HTP through the chamber. It will achieve this by driving a high-performance pump, which is actually an updated version of a unit that was used on the UK's old nuclear cruise missiles. Engineers have the complex task of getting the rocket, the CA2010 engine, and its missile pump to all work in perfect unison. The Newquay tests will be the first time the Bloodhound team has seen the trio and their control system run in anger. Testing will be conducted inside a concrete-hardened hangar used in the past to house Tornado fighter-bombers. The Bloodhound team will check the various components of their rocket rig over several days, leading up to a major firing of the 18in chamber, probably on 3 October. For that test, HTP will be fed into the chamber at a pressure of up to 600psi (2.7MPa), delivering an average thrust of 16,000-18,000lbf (70-80kN) with a peak somewhat over that. More recently, in the 1980s, the Stonechat motors for the Falstaff research rocket were fired at Wescott in Buckinghamshire (60,000lbf; 270kN). The Bloodhound hybrid is probably the most impressive since then. "There has been a series of motors that may have had a higher thrust or a longer burn time, but the actual scale of our Falcon rocket - its total impulse - makes it the biggest in the UK for about 20 years," said Mr Jubb. Full-scale production of the Bloodhound car's body is progressing. Carbon fibre specialist UMECO, in Derby, will shortly begin laying up the composite monocoque and aerospace engineers Hampson, based in Wigan, have completed the lower-rear chassis ready for assembly. Construction should be finished with the car ready to begin "low-speed" trials on a UK runway in mid-summer 2013. A year from now, the team aims to be at its specially prepared track in Hakskeen Pan, Northern Cape, South Africa, and starting the high-speed campaign. In 2014, the ambition is to not only set a new world land speed record but also to take a car through the 1,000mph barrier for the first time.